The Gin Rin Koi is a specific type of fish that is distinguished by its breathtaking, sparking scales. This characteristic is most apparent in younger fish, and will subside as they age. 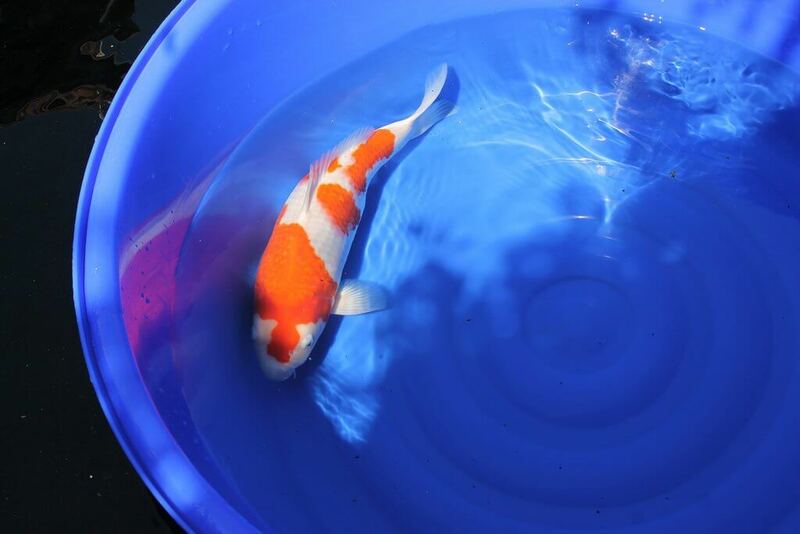 Nevertheless, this is one of the most prized varieties of koi and is sought after by enthusiasts. As with many other types of koi, the Gin Rin originates in Japan. It was created by a respected breeder by the name of Hoshino in the early 20th century. It is said that he encountered a fisherman that had captured a magoi that had scales which glittered magnificently. Hoshino decided to use this fish as the foundation of what would later become the Gin Rin Koi. It took time and a tremendous amount of work by multiple breeders throughout Japan, but the trait was eventually established and further refined into four distinct scalation subtypes by the 1950s. Today virtually every type of koi contains a Gin Rin variant, and judging standards have been developed for it. In order for a fish to be classified a Gin Rin Koi it must be a koi which displays a minimum of three Gin Rin scale rows which are complete. Furthermore, fish which display Gin Rin traits will first have to qualify as the base variety. For instance, a Kohaku fish has to display all the show quality attributes which are associated with Kohaku before its Gin Rin traits can be judged. When the scales of Gin Rin Koi are covered by red pigment they will appear golden. If the scales are covered by a black or white pigment they will display a silver appearance. The most ideal scales for Gin Rin will begin at the base of their shoulder or head and then extend to the base of their tale and on the dorsal skin sides. The scale rows should be aligned neatly without being mismatched. A koi must have a minimum of two rows which are complete, but three or more is most ideal for a Gin Rin classification. Overall, symmetry is incredibly important when judging and evaluating these fish. Their body conformation is also crucial. Unlike other fish, there are few specialized requirements for maintaining Gin Rin Koi. They can be handled much like other koi in regards to their feeding and longevity. Their temperament overall is very similar. Some enthusiasts have stated that Gin Rin Koi do not appear to become as big as other koi, but in general, large koi is uncommon in most small, backyard ponds and the typical hobbyist won’t notice much of a difference. The Gin Rin Koi is a wonderful fish to have in your collection and its sparkling scales never fail to impress and intrigue. The best way to select Gin Rin Koi is to first choose your preferred variety of koi and then find one that has the Gin Rin sparkle.